Calling all runners! Our First Annual "Raise the Roof 5K Fun Run" is coming up on October 20th! 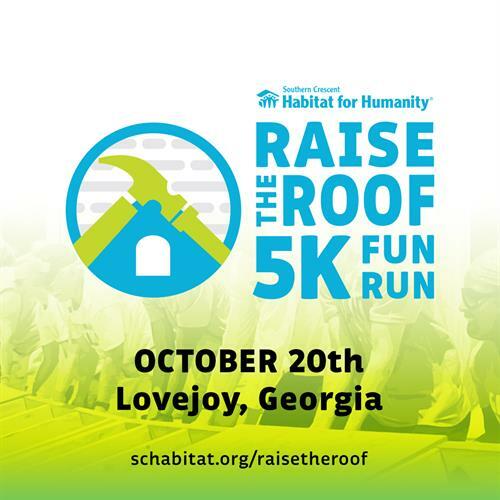 SCHFH’s “Raise the Roof 5K Fun Run” is a family-friendly event in Lovejoy, GA. Runners will have a chance to tour a Habitat for Humanity home in our new Hannah Springs neighborhood, engage with current and future Habitat home recipients, and support the need for affordable housing in Clayton, Henry and Fayette counties. Help us “run” into the future of affordable housing! If you are interested in participating or sponsoring this event, please visit www.schabitat.org/raisetheroof for more information.